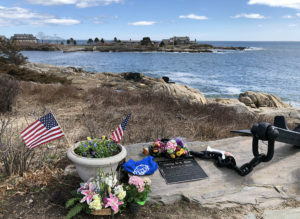 President George H W Bush was one of Kennebunkport’s most revered and loved residents. He never missed a summer in the seaside community he called hom e… except for the years he served in the war. Walker’s Point was his family compound, his happy place…. and his Anchor to Windward remains on the shore along Ocean Avenue as a legacy and tribute to this courageous, kind, strong leader of the free world, and family man. #1 Walkers Point on Ocean Avenue is known as the Bush Compound. This spectacular peninsula off Ocean Ave was President Bush’s summer retreat throughout his entire life. The estate was purchased in the late 19th century by his great-grandfather David Davis Walker. 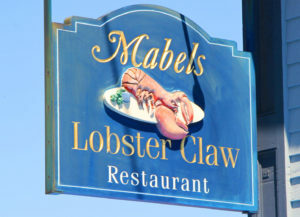 During George W H Bush’s presidency – Walker’s Point was called the “Summer White House” – dignitaries and celebs from all over visited this iconic point for lobster bakes, boat rides, conversations, even Summits. 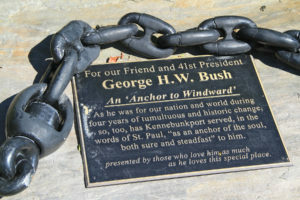 Evidence of the community’s love for President Bush is the actual “Anchor to Windward” gifted from the townspeople of Kennebunkport to their beloved #41. Walker’s Point, the Bush family compound, continues to be enjoyed by George & Barbara’s children, President George W – known as 43 , Jeb, Marvin, Neil, Dorothy – known as Doro, and their grandchildren – including Jenna Hager Bush – oft seen on the Today Show. 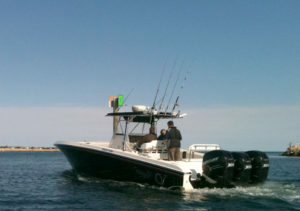 #2 On the Water, President Bush loved to fish and to boat. Being on the Kennebunk River or the cove at Walker’s Point or out to sea was where he loved to be. His presidential yacht, Fidelity with its gorgeous deep blue hull, and three big outboard engines, was a favorite sight for lobster fishermen, recreational boaters and folks on the breakwater. 41 always had a big wave to onlookers. He loved to zip down to Ogunquit and Perkins Cove, with the Secret Service boat and US Coast Guard tailing and trailing him…. just trying to keep up. President Bush wasn’t shy about his need for speed on the water. #4 Cape Arundel Golf Course – George H. W. Bush loved to play golf, and this was his course. He was often seen bright and early playing a quick round, with his secret service detail zooming around on golf carts keeping up with 41 for his 18. The annual George H.W. Bush Cape Arundel Celebrity Golf Classic is held here, the President would play, often both 41 and 43, even President Bill Clinton, along with sport celebs like Patriot’s Tom Brady and former Boston Red Soxs, Bruins, and sports commentator Jim Nance. The Club House at Cape Arundel Golf Club is called the 41 House in his honor. 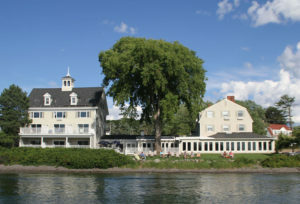 #5 The Colony Hotel hosts the dinner party for the George H. W. Bush Celebrity Golf Classic every June. The highlight of the fundraising evening is the awarding of the Points of Light award, recognizing the best volunteer of the year for Gary’s House – safe home for families whose children are being treated at nearby hospitals. 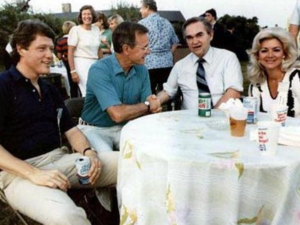 #6 Stripers at The Breakwater Inn & Spa – The Bush family loved to come to Stripers, often dining in a private room with a fantastic river view at sunset, but President Bush was always gracious to shake hands or pose for photos with folks on his arrival and departure. #7 White Columns – First Family Museum. 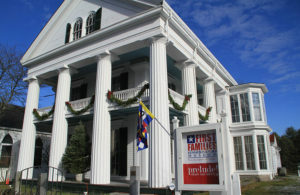 The Kennebunkport Histor ical Society has a photo-filled museum honoring the Bush family, the 41st President and First Lady’s time in the Oval Office, and their time in Kennebunkport. On Maine Street, in the 1853 Greek Revival Nott House, is this beautiful pictorial of the Bush family, the fun and friendships they made here in Kennebunkport, and the legacies left by Barbara Bush, June 8, 1925 – April 17, 2018, and the love of her life President George H W Bush, June 12, 1924 – November 30, 2018. 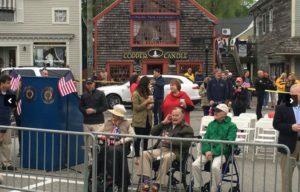 President and First Lady Mrs Bush will forever be in our hearts and memories in Kennebunkport, with little remembrances about town at local spots and lookouts. They loved this town, and this town loved them. “This is America … a brilliant diversity spread like stars, like a thousand points of light in a broad and peaceful sky.” – President George H W Bush, our longest living US President at 94 and youngest US Navy pilot in 1941. 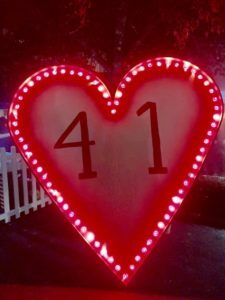 The anchor chain is a fitting symbol of respect to honor “41”. Many years ago, while my husband and I were walking on Marginal Way. President Bush passed by with another elderly gentleman. Kennebunkport is a beautiful place in our magnificent state.